Tessa Longbons | April 3, 2019. Delaware’s pregnancy report for 2017 was published in February 2019 by the Delaware Department of Public Health. The report shows a sharp decline in abortions from 2016. *Information on Delaware’s state abortion rate and Planned Parenthood’s Delaware market share is not publicly available. There were 1,890 abortions reported in Delaware in 2017, down almost 13 percent from the year before (Fig 1). Chemical abortions also dropped by 13 percent from 1,049 in 2016 to 915 in 2017. In 2017, chemical abortions made up 48 percent of all abortions reported in the state. Total Delaware abortions have fallen by 63 percent since 2000. 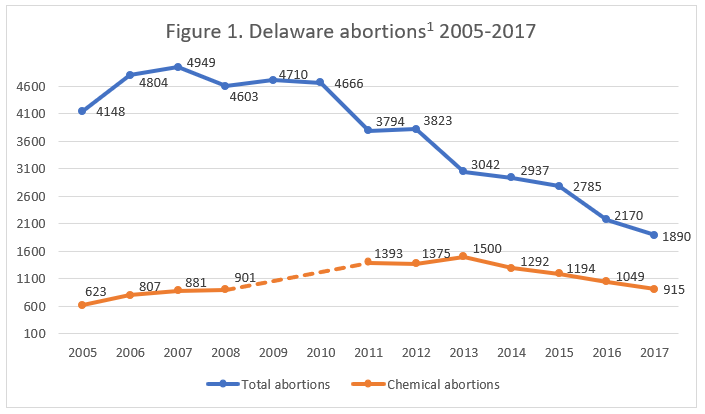 Chemical abortions have increased by 136 percent from 2002, the first year that Delaware reported this abortion method as a separate category. The Charlotte Lozier Institute estimates that Delaware’s abortion rate in 2017 was 10.5 abortions per 1,000 women of childbearing age, down from 2016 (Fig 2). In 2017, 88 percent of the abortions reported in Delaware were performed on state residents. More than half of the abortions, 58 percent, were performed on women in their twenties, while 29 percent were performed on women in their thirties and three percent on women age 40 or older. Nine percent of the abortions were performed on girls under the age of 20, including four girls under the age of 15. As in other states, African American women were overrepresented. Fifty percent of the abortions were performed on white women, 43 percent on black women, and three percent on women who were American Indian, Asian, or Pacific Islander. Four percent were of a different race. Delaware does not report the state abortion rate, but CLI estimates that in 2017, the abortion rate among white women was 7.9 abortions per 1,000 women of childbearing age, less than half the abortion rate of 16.3 abortions per 1,000 black women of childbearing age. Fifty-seven percent of the abortions were performed on women who reported high school as their highest level of education. Nine percent had not finished high school, while 14 percent reported one to three years of college and another nine percent reported four years of college or more. Education was not reported for 10 percent of the abortions. A high majority of the abortions – 88 percent – were performed on single women, compared to 12 percent performed on married women. Forty percent of the abortions were performed on women with no previous live births, just over a quarter on women with one previous live birth, and just more than a third on women with two or more prior live births. Sixty-three percent of the women reported no previous abortions. Twenty-three percent had one prior abortion, and 13 percent had two or more. Fifty-eight percent of the abortions were performed at eight weeks of gestation or earlier: 19 percent were performed before seven weeks, another 19 percent were performed at seven weeks, and an additional 19 percent were performed at eight weeks of gestation. Twenty-one percent of the abortions reported in Delaware were performed between nine and 10 weeks, and 12 percent were performed between 11 and 12 weeks. Eight percent of the abortions reported in Delaware occurred between 13 and 15 weeks of gestation. Two percent of the abortions were performed between 16 and 20 weeks. There were five abortions performed at 21 weeks of gestation or later – more than five months of pregnancy, when babies can feel pain. There were three abortions of unknown gestation. In Delaware, abortions are prohibited after viability unless the life or health of the mother is at risk or the baby has an abnormality that threatens his or her life. Abortions in Delaware have been dropping over the past few years. Some reports have credited Delaware’s comprehensive contraception program, which the state rolled out in 2014 in partnership with a nonprofit organization called Upstream, as the main cause of the decline. However, as CLI pointed out in a recent editorial, these reports fail to take into account the impact of abortion clinic closures in Delaware. The reports do not acknowledge other drops in Delaware’s abortion rate that occurred before the contraception program took effect. 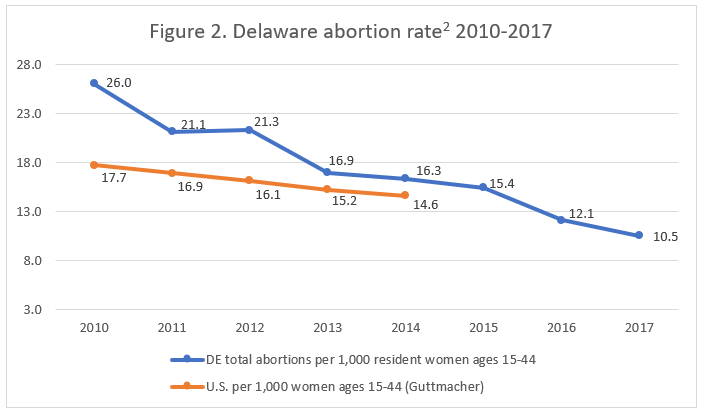 Because Delaware does not report the number of abortions performed at each clinic in the state, it is difficult to determine the relative effects of clinic closures and the new contraception program on Delaware’s declining abortion rate. These and other factors likely played a role, and by reporting abortions by facility, Delaware could allow citizens to identify more accurately the causes behind fluctuations in the abortion rate in their state. In a CLI study of abortion reporting across the 50 states, New York City, and the District of Columbia, Delaware’s reports were tied at 36th place. In addition to reporting information on the facilities where abortions are performed, Delaware could require doctors to report any complications that result from abortion. Delaware could also collect and report women’s reasons for abortion and why abortions after viability were seen as necessary, as well as whether the state’s parental notification process was followed. Delaware combined data for the years 2009 and 2010 into one report. Chemical abortion totals were not reported for those years. Delaware does not report the state abortion rate. Rates were calculated by the Charlotte Lozier Institute using population estimates from the United States Census Bureau. The rates were calculated using the following formula: (total number of abortions performed in Delaware ÷ number of resident women ages 15-44) x 1,000.